"I just went for my biometrics for my naturalization case, and I'm wondering how long will it take before I get called for my interview? I'm traveling home at the end of May for two weeks with my wife. I don't want to be traveling if I know I could be called around that time." The second questioner should know that what she heard about staying put in the U.S. after a naturalization application has been filed is false. Citizenship candidates can definitely travel abroad, but their schedules should accommodate some important dates – a biometrics appointment, the naturalization interview and the swearing-in ceremony. The first questioner asks how long he should expect to wait after the biometrics. It’s hard to pinpoint a precise time, especially as the answer varies depending on where the applicant filed the case, but for the most part it takes six months from start to finish to complete the naturalization process. It’s possible that the interview could be scheduled in May, or it could come quicker. I’m aware of a recent naturalization candidate in the New York area who completed biometrics and received word of the interview two months later. The U.S. Citizenship and Immigration Service (USCIS) provides a processing timetable at https://egov.uscis.gov/cris/processingTimesDisplay.do. It was last updated at the end of 2012, and at that time citizenship applicants filing out of the New York City office were being called if they filed paperwork on or before June 6, 2012. The timeframe was more or less the same, five or six months, with all USCIS field offices. 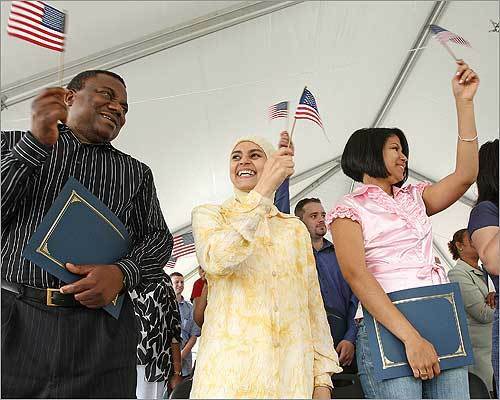 One thing naturalization applicants shouldn’t do is reschedule appointments. USCIS does allow for this, but advises of the dangers. “If you have to miss your interview, you should write to the office where your interview is to be conducted as soon as possible and ask to have your interview rescheduled. Rescheduling an interview may add several months to the naturalization process, so make all attempts to attend your original interview date,” says the USCIS website. After a successful interview, the swearing-in can take place on the same day. Other times the applicant will be notified of when and where to appear by mail, but the wait is in weeks rather than months. Hopefully the timing will work out for the first questioner, but it could be tight with the May trip in the background. It’s hard to say for definite. The second questioner got it right when she suggested that maybe she should wait to start the naturalization process after her summer trip to Ireland. Given the amount of time she’s planning on spending out of the U.S., there surely would be a clash of important dates.